Shattered Planet was released for mobile devices in a FTP version recently (see my preview of that version here), and now the game is out in a premium version for Steam. You can also check out my interview with Tanya X. Short, designer and producer at Kitfox Games. This review covers the Steam version, which eliminates the FTP elements completely. The Galactic Union’s job for you is clear: research the alien wildlife — for science! Earn your pay as a scientist in Explorer Mode, a Daily Challenge, or three crazy-hard scenarios. In-between missions, use scrap metal you’ve collected to upgrade your stats. Just remember — every time you die, your items are gone for good. There isn’t much plot, as you can see from the official summary. You’re a clone, you’re here to do science…and that’s about it. It doesn’t really matter though, because the game is less about a plot thread and more about exploring all the different planets you land on. There is some plot that comes through in the codex entries though. 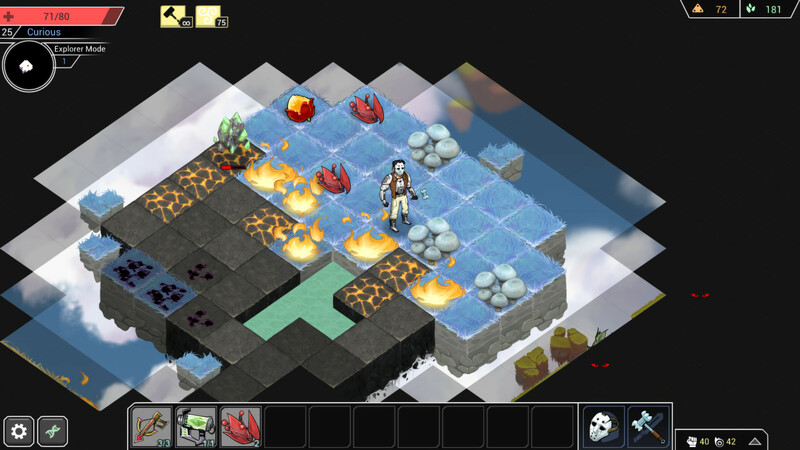 Everything in Shattered Planet is super colorful – I love the art style of this game a lot. 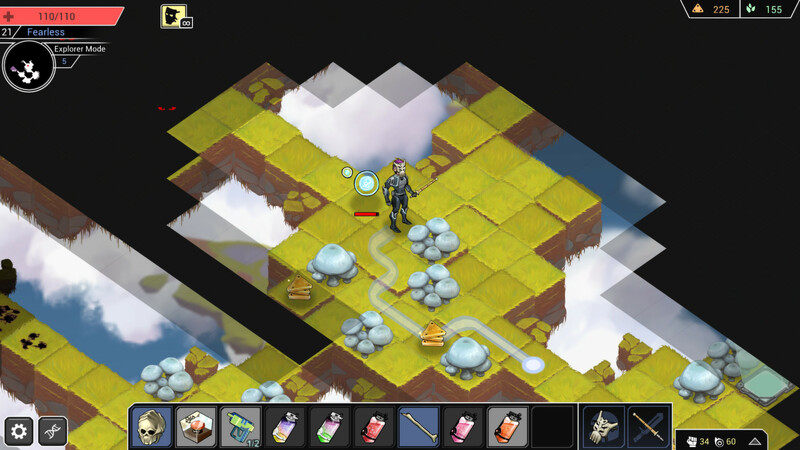 The land is made up of single tiles, and there are a ton of different planet environments to discover and explore. Your character and the enemies are detailed, and you have quite a few diverse options to choose from when you’re picking a clone out in terms of both gender and race. You can also unlock different things to be besides a human – the first one is a robot, and I haven’t gotten to the others yet, but I suspect alien races! There are a lot of cool graphical details – red eyes in the fog of war show you the locations of monsters so you don’t stumble into them, the slowly-spreading blight, the way flames curl up. Animations are always smooth, and it’s fun to see how new creatures will move. The soundtrack is excellent, with the tracks varying depending on what kind of planet you’re on/how far you’ve progressed. This is the important stuff, as far as Shattered Planet is concerned. It seems pretty simple at first, but there’s a lot going on here without being overwhelming. 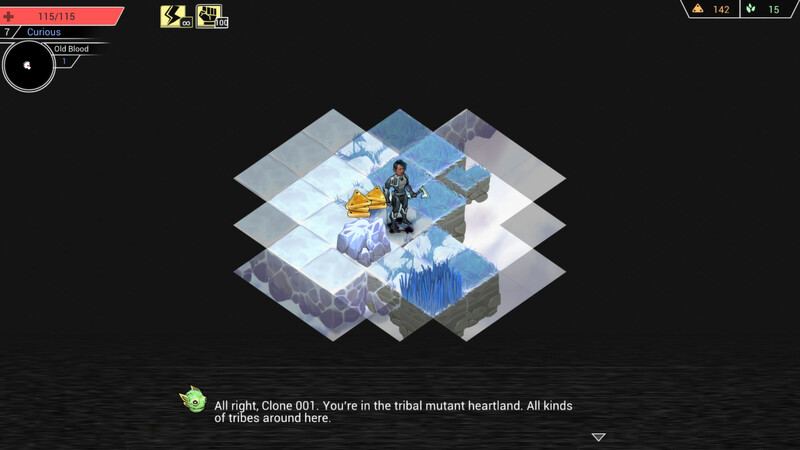 The game is a semi-roguelike – when you die (and you will), you lose all your equipment, but you get to keep your clone’s stats, scrap, and crystals. There are three modes of play: a daily challenge with randomized equipment that you get to keep if you win; an endless mode; and three difficulty levels (hard, harder, and hardest!) of specific scenarios. I haven’t even attempted harder and hardest yet – I know I’ll need a much more buffed-up character. If the monsters don’t keep you busy enough, there’s scientific research to be done. Every time you encounter new terrain, kill a monster, get a new piece of weaponry or armor, trigger an event, and much more, you’ll unlock a new entry in your codex/database. For every ten entries in the database, you get another research level, which gives you some goodies from the Galactic Union and eventually unlocks more clone models. You also get crystals for doing this. There’s always something to do in Shattered Planet, always something pulling you forward, and it never gets frustrating or unfair. There’s also a little element of having to take notes – the game never records what the mysterious liquids do that you find. Sometimes they heal you, sometimes they blow everything up around you. Bring a pen. I mentioned scrap and crystals – there are two different types of currency in the game. Both seem to drop more frequently in the Steam version vs the iOS version. 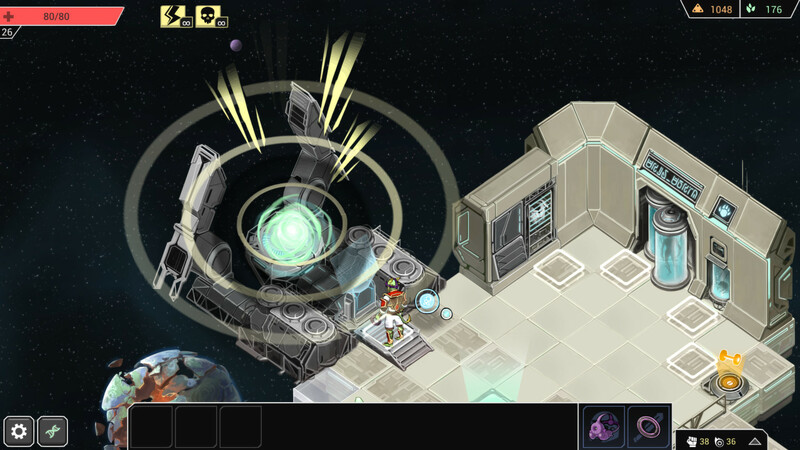 Scrap is used to level your clone up, and crystals are used to buy more equipment from the random equipment generator on your ship. Your ship also has an equipment vending machine that you can use scrap with, and you can sometimes find these on planets too. The vending machine is adorable. There are 71 Steam achievements for the game. Wow. So far I only have 19! Shattered Planet always manages to extend my play session longer than I planned. Pick this up if you enjoy loot, exploring, space, and weird creatures. I also can’t wait to play Moon Hunters from Kitfox Games, their upcoming successfully funded Kickstarter game. Check out the official site and follow the team on Facebook and Twitter. You can get the game on Steam for $14.99.